STANDING IN FRONT OF THE RESTAURANT? 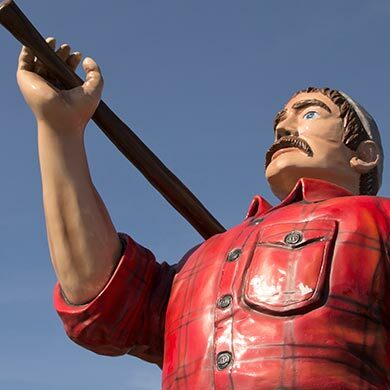 This statue represents the hard work and enormous plates of food that each and every Lumberjacks Restaurant prides itself on! The culture of Lumberjacks is one that reflects hard work, exceptional service, and respect for every crew member AND customer. Sure, it's a lot of work, but the success of Lumberjacks has been achieved and recognized time and time again; and with the Lumberjacks team at their side, franchisees are given the necessary tools and support needed to keep them going year after year. 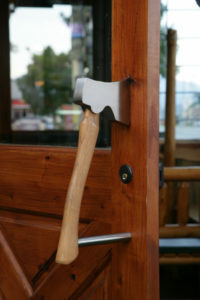 When walking up to a Lumberjacks Restaurant one of the first notable things seen is an ax handle. Yes, it's the door handle to the entrance of the restaurant. Then, beyond the door is an inviting log cabin style themed atmosphere -- from old saw artifacts on the walls to the juniper tree behind the counter. The Lumberjack theme flows throughout the building. The Lumberjack experience reminds patrons of an old-fashioned family-style dining experience that screams home-cooked meals...in both flavor and size! When Founder, Jeff Garret, opened the first Lumberjacks Restaurant in Redding, California in 2004, he knew the restaurant industry was tough. But through hard-working and commitment to building a great, sustainable business model, the success of Lumberjacks has gone through the roof and in relatively short order. 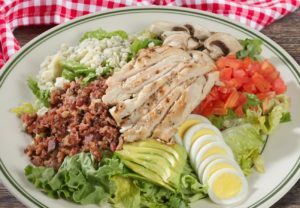 With development of both corporate and franchise restaurants, Lumberjacks has quickly yet methodically expanded to nine locations in California and Nevada. Now, continuing to grow fast and through a franchise model, there is no plan of stopping anytime soon with growth projected throughout the Rocky Mountain region and beyond. 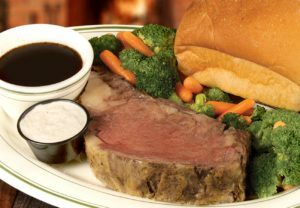 By offering an extensive menu of classic dishes with something for everyone, families can enjoy a log cabin dining experience that they just can't get enough of at any other place. With a value matched by none, Lumberjacks is proud to announce its next wave of growth and continues to look for additional qualified franchisees to help carry on the Lumberjacks legacy. Jeff Garrett has been Lumberjacks' Founder and President since the brand's inception. 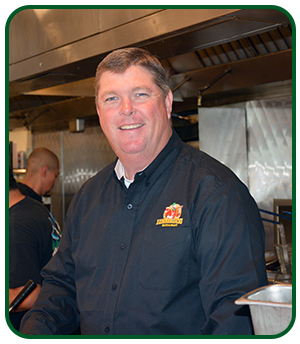 With over 30 years in the restaurant industry, Jeff is an innovative and experienced businessman and entrepreneur. His many years of experience working with other franchise concepts have helped him develop and fine-tune his own theme-style restaurant. Jeff and his wife, Susan, became inspired to start a cabin-themed eatery with country-style, home-cooked meals at affordable prices. They put their plan in motion and came up with the name Lumberjacks, and with a very appropriate tagline, "Where The Big Boys Eat!" The concept continues to be a huge success. From the minute the doors opened in 2004, there was a line of hungry patrons from open to close as word of this new, unique restaurant spread far and wide. Despite immediate success, Jeff spent the next 10 years further developing and improving every detail of the operation. This was a passion for Jeff, to ensure Lumberjacks guests would continue to be satisfied and to solidify the business model for future Lumberjacks franchisees. With his experience with other restaurant franchises, Jeff formed a strong opinion as to what it would take to succeed as a franchise brand. "I've been involved in a few franchises and I know what not to do," he says. "It was always franchisee against franchisor, and I knew Lumberjacks had to be different, and I'm proud to say, we are. I strive to make franchisees part of our family. I make sure to listen to their ideas as they may see things that I don't always see. I want to tap into their experience both as Lumberjack franchisees and from their past, as well. Doing so has proven very valuable, indeed!" Though each restaurant has a distinct personality, Jeff always focuses on core qualities to ensure they remain the same, regardless of location: Quality meals, clean facilities, and friendly staff are all core qualities necessary to long-term success. Jeff says, "If we greet our customers as they walk in the door, they'll probably come back. If we provide them with quality meals at reasonable prices, they'll probably come back. if we take care of customers' needs, they'll probably come back. But, if we take care of all of these items, all the time, they WILL come back...again and again and again!" THIS is the culture of Lumberjacks! Scott Bailey has served as Lumberjacks' Vice-President since 2007. He also has over 30 years of experience in the restaurant industry managing various restaurants, including franchised restaurants. Scott has opened numerous restaurants from the ground floor up and also has spearheaded extensive remodels of tired and closed buildings and businesses. In the process he has recruited, hired and personally trained hundreds of employees. It's these employees that have proven to be at the core of success at each location, and Scott's success as a restaurant professional. It was that level of professionalism that moved Scott along within the restaurant industry and resulted in his appointment to President of the California Restaurant Association for the Shasta Chapter, a position he held for eight years. It was during this time that he was fortunate to have met Jeff Garrett. In addition to selflessly giving his time for the good of the restaurant industry, Scott also held the position of Director of Operations at Logan's Roadhouse where he was responsible for opening and operating seven Logan's Roadhouses from Redding to Fontana, California. While organizing a fundraiser for the "Best of the Best" for restaurant owners in the Redding Area, Scott was truly inspired by Jeff. "His restaurant was always so busy, extremely busy," Scott thought to himself. " Every time I drove by, I saw a line of people out the door." By Scott's direction, the Board of Directors of the California Restaurant Association unanimously agreed that Jeff Garrett deserved the recognition and voted Jeff, Best of the Best. Scott recalls, "I actually met Jeff for the first time as I handed him his award." A few months later and after getting to know one another better, Jeff pitched his idea to Scott about making him a partner and pitched his idea of launching Lumberjacks as a franchise brand. Scott took the risk of leaving his corporate job for the opportunity to develop a single restaurant into a Lumberjacks franchise and as a stepping stone to further franchise expansion. it was to be the brand's franchise model prototype. It was also an opportunity to realize his dream of becoming part of something much bigger than anything he had ever been a part of before. Over the next few years, his impact has resulted in the brand growing to five corporate restaurants and after officially developing the franchise model, four franchise restaurants with more on the horizon. 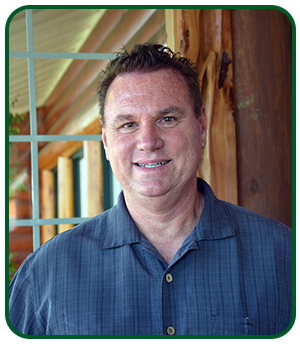 Bob Kirshner is Lumberjacks CFO and Vice-president of Franchise Development. He has held these positions for the last 2 years with the company. Bob understands the key to Lumberjacks’ success is having great tasting home style meals made from scratch at a reasonable price. So he has developed tools to help keep that quality food for the Lumberjack franchisee by using food management programs to control costs. He has negotiated favorable pricing of products & services, while developing training & support systems to control costs. The documentation of recipes, procedures and training manuals has helped Lumberjacks deliver consistent quality food to their customers. No matter where you go, Lumberjacks quality and service are the same. He has also been instrumental in setting-up the marketing department to develop menus, restaurant promotions and advertising. Lumberjacks is a 9 store chain with 5 franchises throughout California and Nevada and with a new opening in Bakersfield, we needed his expertise to take our concept to the next level and make sure we are ready for growth and support of our franchisees. Before joining the team, Bob knew this was a successful business model and with his 25 years’ experience in the restaurant industry working as a CFO, we knew he would be an asset to the group. 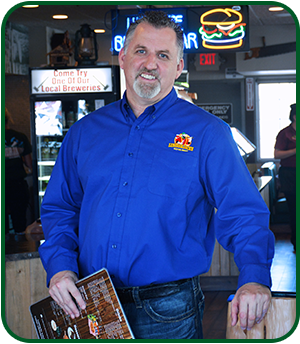 Bob came to us from a Multi-Unit Franchisee owning 42 units with concepts like Applebee’s, Burger King, Marie Callenders and Logan’s Roadhouse that operated in multi-states. He brought a wealth of diversified experience in quick serve as well as casual dining and helped the concept grow from 16 units to 42. Bob brought with him the same culture as Lumberjacks. He believes the customer always comes first by delivering quality food at a reasonable price with a great experience. He believes the restaurant industry should be fun and if your employees are enjoying themselves, then the customers join in. We filled our bellies and had plenty of steam to make the interstate journey back to our place. The coffee mugs ALONE make you feel at home. Locals love this place and visitors quickly find out why. 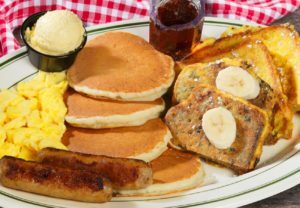 Voted #1 breakfast in Redding several years in a row, we love it. The portions were twice a big as expected! I had the Denver Omelette, and it was HUGE. They serve your food on platters, and you get more than you pay for. I always leave with a doggy bag! Loved the food. The Walnut Salad was great. The 1/2 size was plenty. Husband got the Cobb and it was great, too. Service was excellent and very friendly. Franchise candidates must have a proven track record within the restaurant industry. They must exemplify they are hard-working self-starters with a drive and propensity for excellence in a food service environment. They must be students of overall restaurant operations. Franchise candidates must unequivocally believe Lumberjacks guests always come first. They must understand and strive towards delivering a positively memorable experience to guests at all times. Lumberjacks guests are Priority One! Franchise candidates must truly believe managers and staff are the most important assets to building a sustainable restaurant business. They must work diligently to ensure that message resonates with both managers and staff at all times. Franchise candidates must understand hospitality and consistency are both key to building customer loyalty. They must realize that in today's digital world how quickly a bad experience can be shared with long-lasting negative effects. Conversely, they must also understand how hospitality and consistency of a positive nature will drive satisfaction levels to the point guests will tell others about their positively memorable experience at Lumberjacks. Franchise candidates must understand the value of a branded concept with a proven business system. They must acknowledge and continuously strive to protect the brand and maintain its integrity as it is the brand that is synonymous with everything that goes on within Lumberjacks and is the basis for a sustainable future for all involved in the Lumberjacks family. Franchise candidates must have a real, relentless passion for the restaurant business and also must demonstrate similar passion for the Lumberjacks brand. 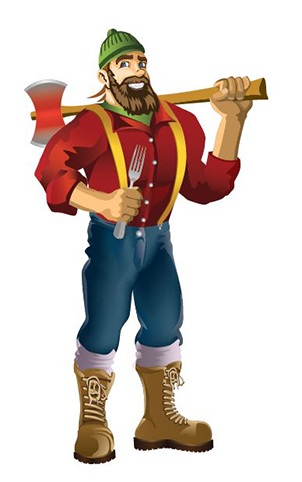 Are you interested in opening your own Lumberjacks Restaurant? If so, it's more than just joining our mailing-list-- you would be joining our family. We want you to receive the education and support that any good family would want for their family members, and more. The success of the Lumberjacks name, just like that of a family name, depends on the individual successes of each and every person in the family, even more so of the key family members -- for Lumberjacks those family members are our franchisees. Like a proud parent, we pride ourselves on making sure that everyone in the Lumberjacks family is prepared to carry on the family name. In our case, the Lumberjacks name! Before opening your Lumberjacks Restaurant, you will attend our four-week initial training program. This program covers every aspect of restaurant operations, the Lumberjacks way. This includes training in food preparation, customer service techniques, equipment maintenance, a point-of-scale system, marketing and mush more. In addition, each of your Kitchen Managers, Line Cooks, Prep Cooks, and Head Servers will receive training specific to their individual tasks and as team members working together. Once the doors are open and the first customer grabs that ax handle on the front door, you will have a trained staff with in-house support from our training team. Yes, we will be there to help you start your business and get it started on the right foot. We'll provide general assistance and guidance to maximize the success of the restaurant, your manager, and all crew members. Thereafter, ongoing support and training is readily available to help keep your Lumberjacks managers, staff and crew refreshed and up-to-date on new products, techniques, processes and procedures. We are all family at Lumberjacks, and it's important that we learn and grow together. We wouldn't have it any other way! Utilizing specific criteria for identifying viable markets for Lumberjacks restaurants, we have identified a select number of strong markets throughout the Western United States. We know these well-populated areas with steady traffic flows are just waiting to have Lumberjacks call them home. We also know some of the areas have underperforming or even closed restaurant locations that might fit within the Lumberjacks franchise model as a rebranded, remodeled restaurant, the Lumberjacks way! So if you have a location that you think would be the perfect spot for a new Lumberjacks Restaurant or know of a closed or underperforming restaurant that needs some rejuvenating, please let us know and together we can make it happen! investment range varies greatly from the lower costs of converting an existing building to the higher costs associated with building a brand new restaurant. Of course, the choice is yours and we will equally support you in both cases and those in between. It's to our mutual benefit to do so. After all, that is what family does -- help each other! 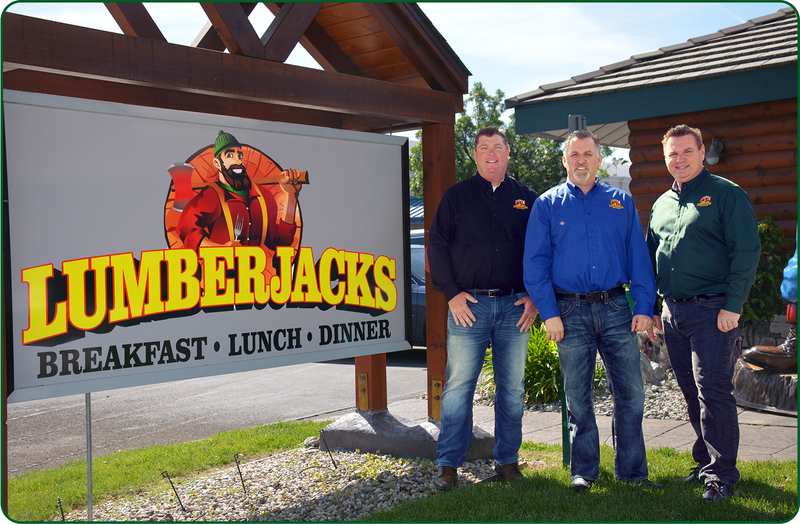 Success within Lumberjacks and specifically within its business model has been proven again and again because it all starts with selecting the right franchisees. Leaders with restaurant industry experience, customer-focused mindset, and team-driven philosophy are ideal candidates for the Lumberjacks franchise opportunity. We know these individuals are the right fit for our brand. We believe it's those individuals that are crucial to the ongoing success of Lumberjacks Restaurants. Through a carefully tested selection process, we diligently review every application, searching for qualities that will help drive their success as a Lumberjacks franchisee. So, to get the ball rolling we invite you to complete the following short form. Upon receipt you will be contacted by a Lumberjacks Franchise Development Representative who will work with you throughout the process, answering all your questions and providing the information necessary to make an informed decision.